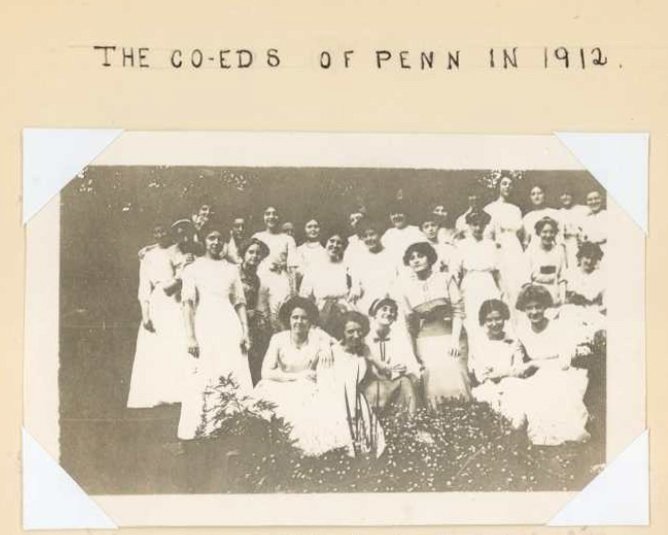 The first women’s yearbook at the University of Pennsylvania dates to 1912. It was a manuscript work of twenty-eight pages. All copies were prepared by hand, with class photographs reproduced and prints hand pasted to the pages. The first printed women’s yearbooks at the University of Pennsylvania were published by the women in the School of Education Class of 1916, as juniors in 1915 and then as seniors in 1916. This yearbook was called the “Women’s Undergraduate Record” until 1946, when it became the “Dolphin.” The final “Dolphin” was published in 1952. The following year, 1953, men from the College and women from the College for Women began to appear together in one yearbook, The Record. The preparation of these yearbooks for viewing on the web was begun in the summer of 2006 by University Archives student intern Tessa Hart. Tessa, a student at the William Penn Charter School, scanned the images and prepared the searchable text of women’s yearbooks to make them available online.